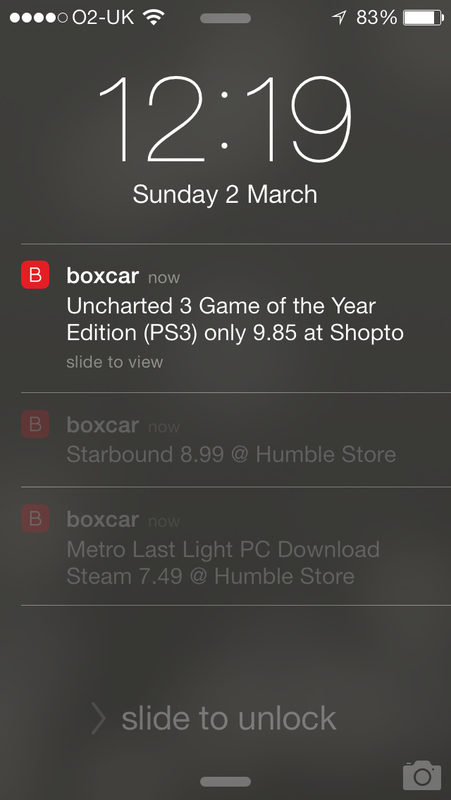 Not wanting to add to my already bursting email inbox and finding the need for a more immediate mobile notification of scripted events I find myself looking at https://boxcar.io and their end-user API . The API provides an example on how to use the service with cURL so as before I will be converting this simple format to use the PowerShell Invoke-WebRequest cmdlet and wrap this into an advanced function. • Like all PowerShell functions you will need to run the code at least once and you can call it as many times as required for the session. The best way to copy the code from a WordPress blog such as this one is to double click in the below window and then copy, this usually preserves the formatting. A function to send Boxcar Push messages. 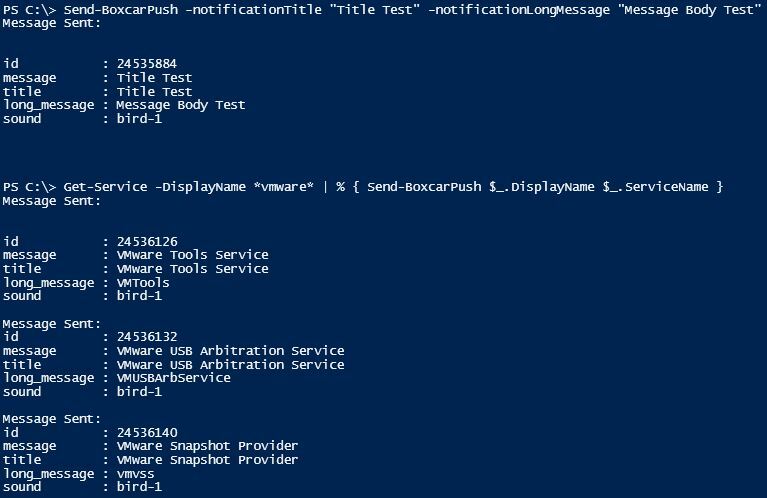 An example of using PowerShell to send Universal Push Notification messages. Typically the target device is a mobile running iOS (https://boxcar.io/client) or Andriod. Message Title/Subject. 140 Character Maximum. Message body text. 1000 Character Maximum. Boxcar Access Token. Its recommended you change this value in the Param section of this function else it will need to be specified each time. 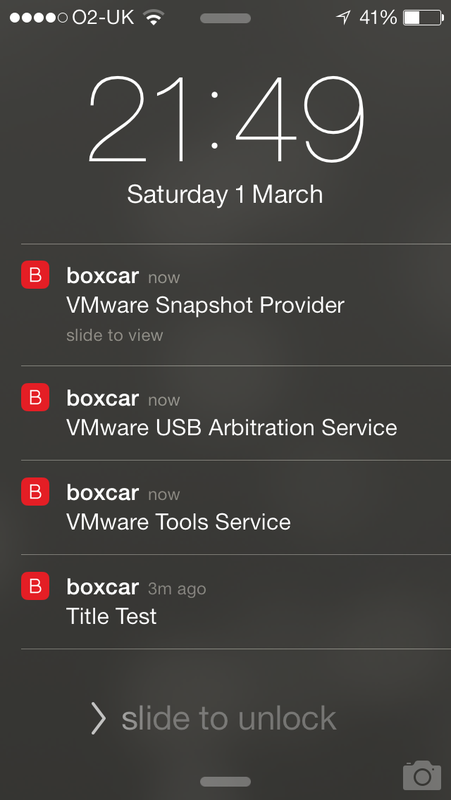 The access token is available from the general "Settings" screen of Boxcar Client app. Send-BoxcarPush -notificationTitle "Test Title" -notificationLongMessage "Body message text"
[ValidateLength(1,1000)] #Max is 4kb so 1000 is playing safe. $hostURI = 'https://new.boxcar.io/api/notifications' #HOST: This is the server to use to send HTTPS API calls. $user_credentials = 'Put Your Access Token Here' #Access Token. Change this value to your own here or specify here. $message = Invoke-WebRequest -Uri $hostURI -Method POST -Body "user_credentials=$($user_credentials)&notification[title]=$([System.Web.HttpUtility]::UrlEncode($notificationTitle))&notification[long_message]=$([System.Web.HttpUtility]::UrlEncode($notificationLongMessage))&notification[sound]=$($notificationSound)"
Boxcar deliver a great service which is free for 200 pushes per minute and its fast, very fast. Boxcar notifications can use 20+ different sounds which I’m starting to find quite useful, for example you can have different scripts use different sounds which I just listen out for and this saves me having to look at the phone. I’m also thinking I could use different sounds for different levels of importance. At work this week I was working with one of our Linux engineers and he used the command “cURL ifconfig.me” which promptly provided him with the external IP of the system. I thought to myself, “I wonder if this is possible from PowerShell” and sure enough it is. Using the Invoke-WebRequest cmdlet we can send http(s) requests to a web service. Note that this is a PowerShell 3.0 only cmdlet. *For security reasons I have recreated the data in my test lab with random names, area codes and telephone numbers etc. First I will store a collection of Users in a variable named $users, throughout this post I will use the Quest AD cmdlets. This is mainly because they are backwards compatible with 2003 based domains but if you are lucky enough to be 2008 you should be able to convert the commands to Microsoft’s AD Module with little effort. $users = Get-QADUser -Description "E164 Sample Accounts"
The above line uses a replace with a single argument so this is effectively a remove. The replace uses a regular expression of Non-Digit contained within a calculated property. WARNING: No Match: Summer.Stevens, "Call me before 11AM 550997"
Once the blackup task has been completed we can now go ahead and apply the new number. Notice that I used an if statement to check that there actually is a value in the E164Number property first and if there isn’t then it will skip that user. Excellent, the majority of users now have an E164 formatted phone number. Well that wraps up this post; I think you’ll agree it’s a nice real world example of using PowerShell with regular expressions to solve formatting issues. This policy setting allows you to manage whether the Windows Remote Management (WinRM) service accepts CredSSP authentication from a remote client. Once enabled this policy sets the WinRM service to accept CredSSP authentication from a remote client. This command once enabled basically allows me to pass my credentials onto any system in the domain that has the WinRM service configured to accept CredSSP authentication. I recommend that you give this a test run before moving onto the next step. Next the answer file used for the DCPROMO demotion, no word replacement was necessary. This was the template answer file used for the DCPROMO RODC promotion. All text that matched ‘<SiteCode>’ was replaced with the Site Code passed from the pipeline, for example if the first value in the $SiteCode variable was ‘AFCPS’ then the line ‘PasswordReplicationAllowed=”DOMAIN1\<SiteCode>-Laptops”’ would be changed to ‘PasswordReplicationAllowed=”DOMAIN1\AFCPS-Laptops”’. PasswordReplicationDenied="DOMAIN1\Denied RODC Password Replication Group"
PasswordReplicationAllowed="DOMAIN1\Allowed RODC Password Replication Group"
I should point out that the passwords in these files are stored in clear text when they are created. The passwords are removed from each file after they have been used as answer files for the DCPROMO tasks, with this in mind you should consider carefully which account you use and not to create these files until you are ready to use them. Before I began to demote servers I created a new OU titled ‘DCPROMO Holding’, this OU also had a GPO linked that would enable PowerShell remoting. By default a demoted server would be returned to the Computer OU and because of this would have all GPO’s removed. With all the prerequisites out of the way I could now start demoting Domain Controllers back to Member Servers. I did about ten servers at a time and I suggest you do the same. I did this by using the Range operator, for example say $Servers was a 100 item array, writing $Servers[0..9] would select the first 10 and $Servers[10..19] would be the next ten etc.. Note the Tee-Object cmdlet, this allows the output of the promotion to appear on the console and also a text file. It would not be difficult to parse the text file for detailed information or collect the data and concatenate this information into a single report. All went to plan, the computer objects for all ten systems were returned to the Computers OU. Checking this OU is actually the quickest way to get an overall feel of the success of the bulk demotion. I then moved the computer objects from the Computers OU to the ‘DCPROMO Holding’ OU. Thanks for reading. I will post the final part over the course of the week so please check back. Scenario: This month presented me with an interesting issue that I would like to share. In effort to provide Role Based Accounts (RBA) to both 1st and 2nd Line Support it became clear that 2nd Line needed to locally administer DCs as they also acted as File Servers at some sites, but being a member of Domain Admins was overkill and as such went against Least Privilege best practices. The solution to this issue was to convert all non-dedicated DCs or FSMO Role holders to Read Only Domain Controllers (RODCs). RODCs run as member servers with a local Security Accounts Manager (SAM) and run AD as an isolated service; this allowed me to configure dedicated local administration. This was achieved by adding the 2nd Line role based account group to the BUILTIN\Administrators group on each local RODC. There are other benefits to RODCs but I’ll not cover those in this post. 1. Sort all Computer and User Objects into Groups that will be used for Password Replication Policies. 2. Set the DNS Server options on each DC NIC to point back to the Core DCs in Head Office. 3. Use the “Install From Media” option of NTDSUTIL to create two local cache copies of the Active Directory. One will be for RODCs and the other will be for Full DCs, the latter could be used for Roll Back scenarios should I wish to restore the DC to its original state. 4. Enable CredSSP used for multihop authentication. 5. Create DCPROMO demote and RODC promote answer files using a word replace template method. 6. DCPROMO demote the DC to a Member Server. 7. Force a restart of the Servers. 9. Replicate the Passwords for the User and Computer Objects to the local RODC responsible for authentication. Luckily this step was particularly straight forward for me due to the fact that we use a five letter code for each customer and this code is used to reference the Site, Parent OU and is also used to prefix the Computer Objects. All I needed to do was create an array of all the Site Codes and store it in a variable called $siteCode, then pass that through to a foreach loop that collected all the Computer Objects for that OU and then added them to a Group following a simple pattern match. I also used the below code to list any Computer Objects that were not a member of a single Group, which for me mainly highlighted incorrectly named systems. Step 2 – Set the DNS Server options on each DC NIC to point back to the Full DCs in Head Office. If you’re going to DCPROMO demote a Server from a DC to a Member Server you will need to be sure that the Server does not reference itself as a DNS Server. I needed to find the teamed NIC that is configured with the DNS registered IP Address of that Server and reconfigure the DNS Search Order. I did this by using PowerShell Remoting to first collect the IP Address from DNS that references the Servers host name and then that information to find the NIC with that configured, and then use a WMI method to set this NICs DNS Search Order to an Array using a couple of DNS Server from Head Office. Step 3 – Use the “Install From Media” (IFM) option of NTDSUTIL to create two local cache copies of the Active Directory. One will be for RODCs and the other will be for Full DCs, the latter could be used for Roll Back scenarios should I wish to restore the DC to its original state. To begin with I needed to increase the amount of memory that a PowerShell remoting session can use from the default 150MB to 1GB due to the memory hungry IFM process. This setting can be restored as soon as you have finished creating your IFM snapshots. 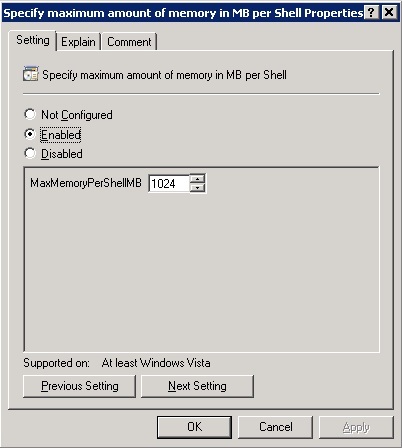 Using the Group Policy Management Console (GPMC) I edited the policy that manages Remoting and edited the setting Computer Configuration/Administrative Templates/Windows Components/Windows Remote Shell/ Specify maximum amount of memory in MB per Shell, this option should look like Figure1. Thanks for reading. I will post the remaining two parts over the course of the week so please check back. The objective of this post is to provide instruction on enabling PowerShell 2.0 remoting capabilities in non 2008 R2 domains. In this example I will demonstrate in a 2003 domain environment. 1. PowerShell version 2.0 will need to be installed on all systems that will be used for remoting. On down level clients PowerShell 2.0 is bundled into the Windows Management Framework. The Windows Management Framework makes some updated management functionality of Windows 7 and Windows Server 2008 R2 available on Windows XP, Windows Server 2003, Windows Vista, and Windows Server 2008. Background Intelligent Transfer Service (BITS) 4.0. I recommend that WSUS is used as the deployment method for the Windows Management Framework on down level clients and it will be assumed from this point that this is already installed as this was released some time ago. 2. The ‘Windowsremotemanagement.adm’ file will need to be imported into the GPO later in the process. This will need to be downloaded as part of the ‘WS-Management v1.1 Package’ at the following link http://support.microsoft.com/kb/936059 . Once downloaded install onto the system you will be using to create and edit GPO’s. Launch the Group Policy Management (GPMC) and create a new GPO titled ‘Windows Remote Management’. Edit the newly created GPO and add both the ‘Windowsremoteshell.adm’ and ‘Windowsremotemanagement.adm’ Templates, if either of the adm files cannot be found please ensure that the ‘WS-Management Package’ is downloaded and installed as advised in the prerequisites. This policy setting allows you to manage whether the Windows Remote Management (WinRM) service automatically starts and listens on the network for requests on HTTP over port 5985 and if enabled HTTPS on 5986. Note: The above ports are correct as of WinRM 2.0. The previous version WinRM 1.1 used the default HTTP and HTTPS ports 80 and 443 respectively, the documentation on TechNet and also on the help section for this GPO have not been updated to reflect this at the time of writing. 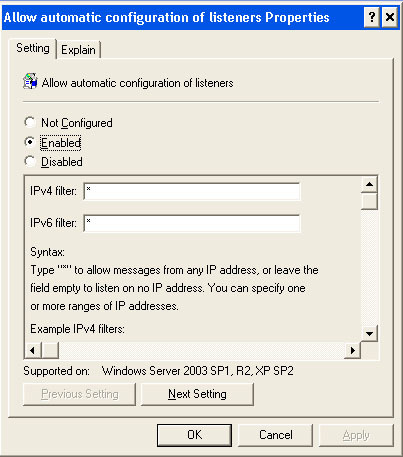 The service listens on the addresses specified by the IPv4 and IPv6 filters. IPv4 filter specifies one or more ranges of IPv4 addresses and IPv6 filter specifies one or more ranges of IPv6addresses. If specified, the service enumerates the available IP addresses on the computer and uses only addresses that fall within one of the filter ranges. You can use asterisk (*) to indicate that the service listens on all available IP addresses on the computer. When * is used, other ranges in the filter are ignored. If the filter is left blank, the service does not listen on any addresses. For example, if you want the service to listen only on IPv4 addresses, leave the IPv6 filter empty. Ranges are specified using the syntax IP1-IP2. Multiple ranges are separated using ‘,’ (comma) as the delimiter. Assuming the GPO in now Enabled and Linked to an OU containing the computers targeted for remoting, log onto one of the client machines in the domain, run “gpupdate /force” or wait for the group policy to be deployed to the client machine. To enumerate the currently applied GPO use the “gpresult” command and confirm that the GPO titled ‘Windows Remote Management’ is listed in the ‘Applied Group Policy Objects’ section. Open up a PowerShell console on a system connected to the same domain and create an array of computers to which you have just enabled remoting e.g. Over the last year I have been using PowerShell 2.0 remoting capabilities extensively and I will follow up with a few example over the coming weeks. I find myself again and again needing a constant flow of email messages to ease diagnosing message flow, so I wrote this little script to assist me. I mainly use this scripted function to test load balancing and perform latency checks but it has other benefits. One such recent example was where I needed to generating enough smtp traffic for a good sized network capture to diagnose a comms issue, this was easily achieved with the AttachmentSizeMB parameter. Generate a constant flow of messages for diagnostic purposes. This script is designed to assist in generating email messages for testing external message flow to and from your messaging infrastructure. The ability to quickly send a batch of messages with an attachment on a schedule can help track flow issues or to simply be used to confirm mail routing. Send an email every 30 minutes for 24 hours. Version: v1.1 - 2012 April 26 - Fixed when only a single HT Server is available. Added check for existing file. Fixed attachment parameter to use varible.